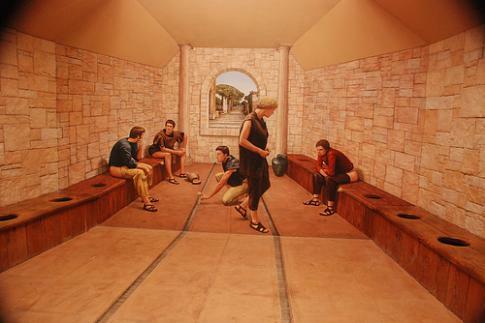 Bringing a whole new meaning to the term 'public lavatory' this piece of artwork featured on a far wall brings added depth to the room and showing what it might be like if other people were in there using the facilities. On a slightly different note - why is there a guy rolling a ball down the grooves in the floor ? Update: Turns out its not a ball but a sponge. Isn't he cleaning his sponge in the water and not rolling a ball? how is this an illusion? It is an illusion do to it looking like a real room when it is actually just a drawing on a wall...There are different types of illusions. where is the illusion here? is it an illusion ? or just a joke? At first I though the whole image was just a painting and didn't get how this was an illusion but once I read the deion and looked at it harder and noticed where the floor grooves look like they slant is actually where the wall/painting is. i realy dont get it. OH I SEE NOW!! it's a painting on the wall!! I have had numerous dreams about being in a very public restroom like this. Glad someone else has had the same dreams. i dont think this is an illusion? ?